Here are Becky’s time tested tips for potting garden plants. Start digging! 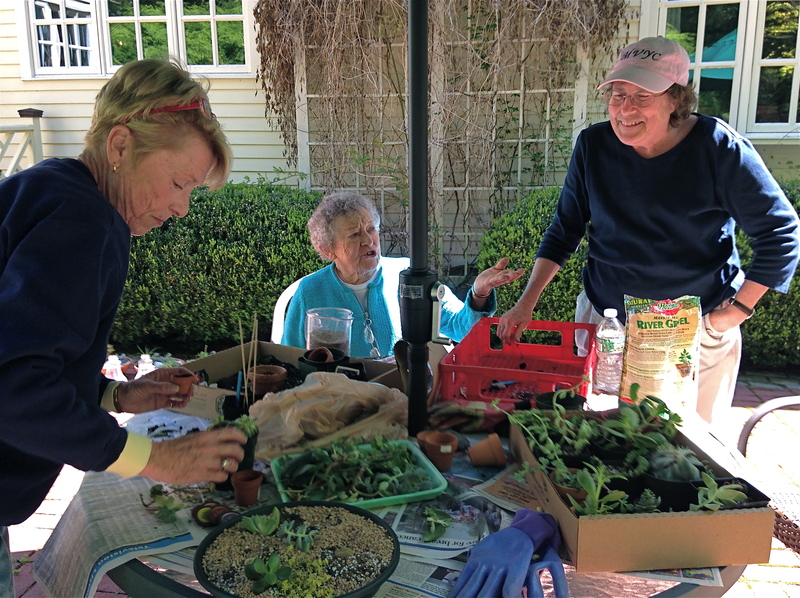 It is a challenge to keep potted plant divisions thriving and looking good until the Garden Club auction in June. This will be especially true this year because our plants are rushing into early growth and we seem to be stuck in an abnormally warm and dry weather pattern. Here are some tips to maximize both your success and the benefit to the club’s treasury. Plants should be divided before they have put on a lot of new growth. For example, hostas can be most easily divided when their little pointed noses have emerged, but the leaves have not unfurled. If your plants have already put on substantial growth, don’t be shy about cutting back some of the foliage. The goal is to have divisions with a good balance between the roots and the growth above ground. Cutting back foliage reduces stress. Similarly, don’t hesitate to trim the roots. First remove any dead or non-vigorous roots, then cut back the healthy roots to encourage new growth. Try not to dig and divide on a hot, sunny, windy day. The best weather is cool and overcast with showers or light rain forecast. If you can’t summon up that perfect weather, protect your newly potted divisions from the sun and wind. Some ideas are to place them on the north side of your house, cover them with a bushel basket, shield them with a beach or patio umbrella. Water is going to be especially important this spring. After digging your plant soak it for several hours or overnight in a pail or tub of water. I have had good luck adding a couple of drops of Super Thrive to the water. The soaking will hydrate the plant and make division easier. Keeping your potted divisions watered can be a challenge. The task is easier if you can keep your plants grouped closely together near your water supply. Plants will also not dry out as quickly if you can bury the pots in a free space in your garden. They will grow happily until you are ready to pop them out in June. Terri and I are always happy to answer questions if you are unsure about when, how or whether to divide a particular plant. If you look for information on internet, some of the most reliable websites are those connected with botanical gardens or universities. Use potting mixtures that do not contain peat. Not only is peat difficult to hydrate, our planet needs those peat bogs to act as carbon sinks. You can make compost in a few months; peat bogs take thousands of years to form. Rolling Green Keeps You In The Green! 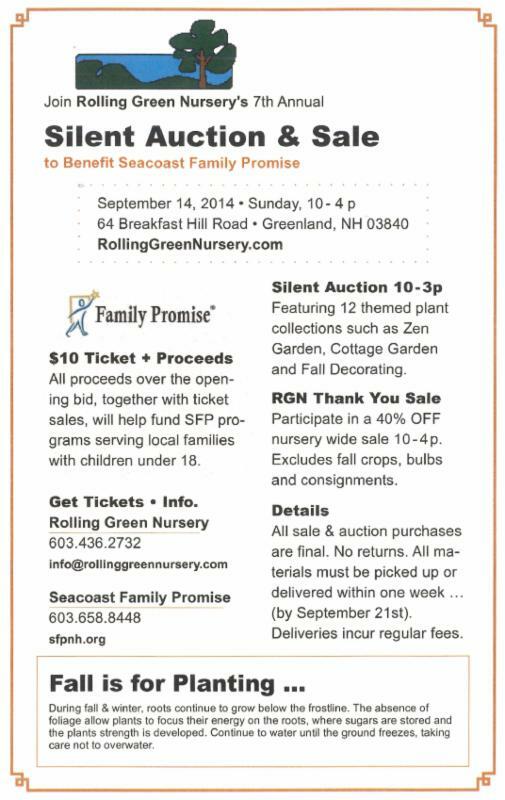 Just wanted to share a great deal coming up that you may want to take advantage of at Rolling Green Nursery! Fall is a wonderful time to plant perennials, refresh your pots with annual and more AND you get to save money while adding to your garden! Tomorrow is the big day! 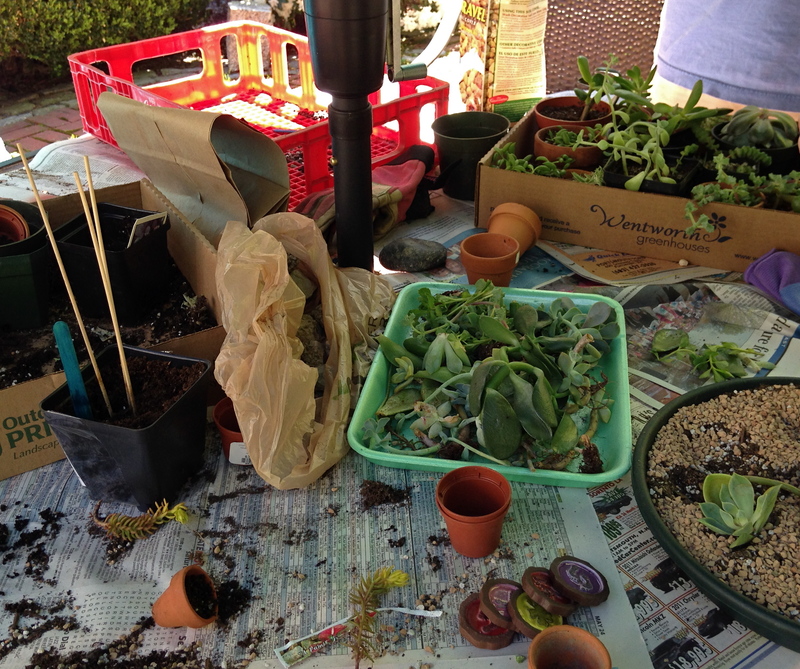 One of the items that you can bid on is a succulent garden for your very own. Terri hosted a planting party which resulted in these centerpieces for the tables. Here is how they looked when first done a month ago or so. It will be fun to see how much they have grown. See you at the auction! It’s time to start thinking about planting. Succulents are beautiful little plants that do well in the garden and in pots. Since they can be quite costly at the garden center, it would be great if you could get your own free plants! How do you do it? Propagating, of course! Here are 4 easy steps. Break off leaves from a small branch, exposing a short stem. Dry, or “callus”, cutting for several days before rooting. Mix equal parts sand, perlite and soil. Water well and use to fill a small pot. Push stem or ends of leaves into the potted soil mixture and tamp around them to set in place. Water and keep the succulents moist in a sunny spot. Watch for new growth in four to six weeks, then repot if desired. In the photo to the left is a propagated night blooming cereus. You may remember that Terri gave out some cuttings one meeting a while back. I decided to try it and it turned out well – notice the new growth on either side of the base of the plant. If you look hard you will see a small shoot on the left. I fully expect to see flowers in a century or so. If I can do it, you can too! Ron gave us a wonderful slide show at the last meeting about gardening in pots and raised beds. He has sent us the recipe for his favorite potting mix. Click to view the slide show he gave about Containers & Raised Beds. Be sure to wear a dust mask and gloves when handling the ingredients. Gently mix the peat moss and vermiculite together (vermiculite can be crushed if handled too roughly). Add nutrients and gently and thoroughly mix. Let the mix sit for at least 24 hours (a week is ideal) so that biological activity gets a chance to start up. Because sphagnum peat moss has some anti-fungal properties and vermiculite is almost sterile, you should not have any disease problems. *Can be purchased from FEDCO Organic Growers Supplies.